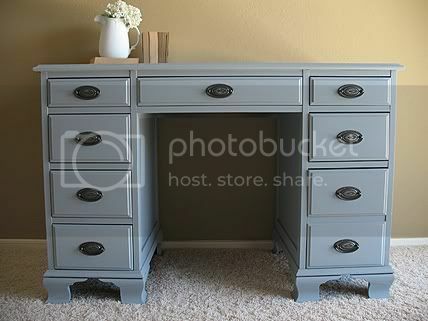 Vintage gray blue desk. Pretty scalloped feet. Solid wood. Dovetail drawers that slide smooth. Original hardware. 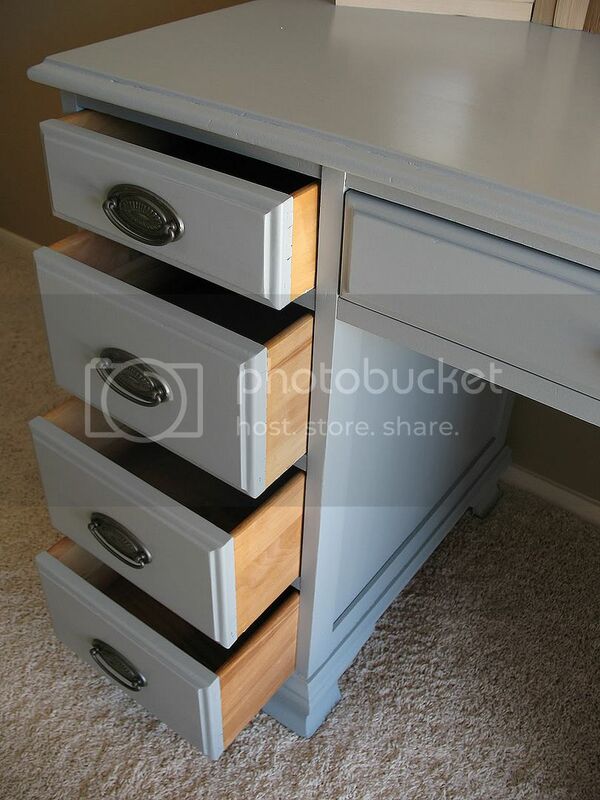 Two bottom drawers on right open together to make one deep drawer, great for files. sooo cute. my daughter would love it! Really nice color, and loving everything on your site. Especially the hutches. Wow! you know this color just makes my heart pitter pat- love it! Nice find! Beautiful job! Thank you for linking to Wicked Awesome Wednesday. Love the color! You do such great work! I’m bummed that I just moved out of Arizona! Thanks for sharing! Oh wow – that is very pretty. I painted my office walls the same color – I just love that shade of gray. Oh, what a lovely desk! I love the color you chose and the hardware is so nice. I’d love to have a desk like this. This is the PERFECT color of grey blue for a dresser I’m wanting to makeover! It’s beautiful and you have some real talent. Would you mind telling me what color it is? Thanks Katy :) Sorry I can’t be more help regarding the color, we actually mix all of our own paint! LOVE the color and the hardware. I love the grey, it’s looks so pretty! Still loving that blue-gray color of yours! It’s gorgeous on the desk. 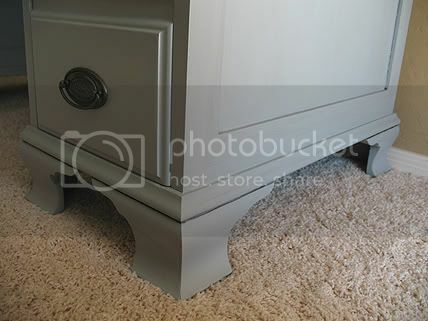 I had planned on using a similar color for some nightstands in my master bedroom but went with a turquoise instead, which went better with my new bedding. 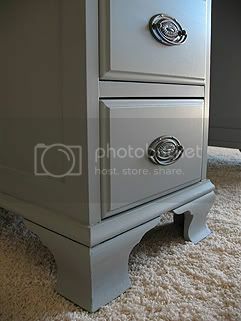 But I’d like to use a nice gray-blue on a piece for a client sometime soon. By the way, I featured this desk in my weekly “Metamorphosis Monday” post today. I love this color blue. I have a similar desk and was going to go “boring cream” with it. I think I may have to try something like this. 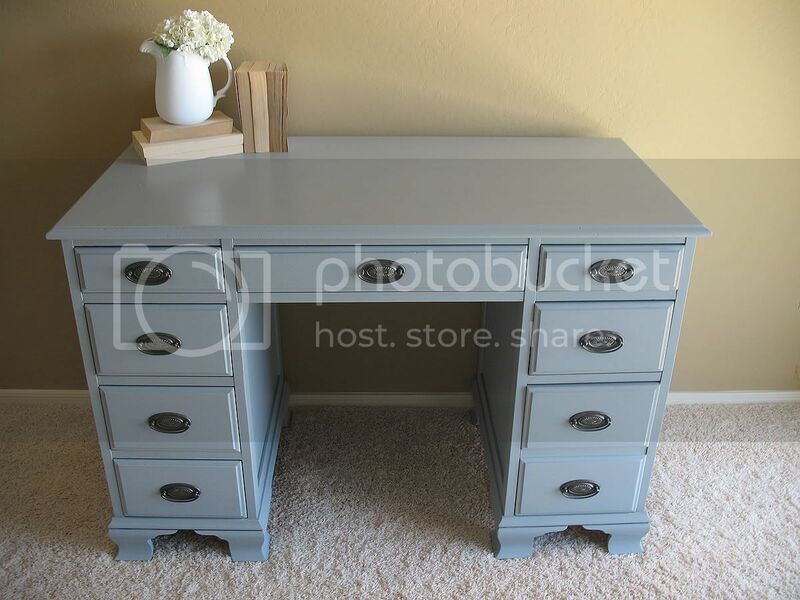 Its blue but seems so much like a neutral and would fit anywhere! Very pretty!